Interpack 2017 in Dusseldorf lived 可达 its reputation as being one of the world’s busiest packaging shows, with AWI staff taking an impressive 300 new contacts during the seven days. 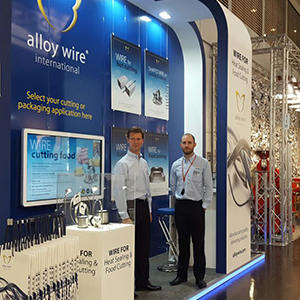 This is a record number for Alloy Wire International and interest came from every part of the globe and for a whole host of applications, including wire for cutting food products, plastic bag sealing and for cutting through polystyrene. We even had one customer enquiring about material for dissecting pineapples…a first for us! There was also strong interest in our ability to supply resistance wire from 0.025mm to 3 mm diameter, from as small as 3 meters and the fact we can deliver within three weeks of orders being placed. AWI again received lots of plaudits for its stand, with the vertical design helping to make us stand out from the crowd, whilst the new video presentations detailed all of the different applications for our resistance wire.